I am compelled to copy a short paragraph from page 56 of Deb and TJ Akey’s book, “How NOT to buy a cruising book. Just two days ago I cried for for an hour after rejecting an offer I made on a CSY 33. I convinced myself it was the perfect offshore cruiser for me. A thorough inspection was done by a professional surveyor and by two experienced circumnavigators on a CSY 44. Reading the surveyor’s report and hearing what my CSY expert friends told me, I knew I had to decline the purchase at the agreed upon purchase. Before I put my phone back in its case after telling the broker I was cancelling our contract my eyes welled up with tears. For the next hour I cried while driving away from Miami’s Dinner Key Marina to visit a sailing friend in Port Charlotte. I finally calmed down when remembering the Melbourne Yacht Club was hosting their annual adults in prams race that night. I changed course and headed north. The next day I resumed my internet boat buying search. I also looked for more information on buying a used boat. When I read page 56 in the book by Deb and TJ Akey I decided to reprint this paragraph in hopes of reminding myself and others that walking away is the ticket to finding the perfect boat. and give the broker a chance to earn his or her cut. Look at some other boats. I’m not saying that the first boat can’t be the boat in a week or month. In all likelihood, it will still be around. …. Good boats do grow on trees. Considering that I am 70, I had to laugh at his youthful spirit. If an interviewer asks me if I am confident about continuing my quest to sail alone to faraway places, my honest answer is ‘well sort of.’ My confidence is a mixture of yes and no. I am certain I can afford to purchase a seaworthy sailboat. I am certain I can leave my house for a few years. I am certain I can sail. Sailing and seamanship are different. I can make a boat go upwind, trim for speed, tack, jibe and drop an anchor. Seasmanship requires much more than that. Am I smart enough to predict counter currents, weather and foreign aids to navigation? Sure, I safely entered and exited harbors alone while I transitted the Bahamas, Turks and Dominican Republic. My GPS was dependable. What if it breaks and I have to rely strictly on visual navigation? Just writing about my seamanship insecurities is causing stress. Pardon me while I take 5 deep breaths. In through my mouth, hold a second or two, exhale slowly. Again and again then two more iterations. Wow, now in a more relaxed state I remember what John Marples, designer of my previously owned trimaran advised. Unhesitatingly he said, “Buy 2 or 3 portable hand held GPS units for back up.” Sounds like a simple solution (as long as the batteries stay charged). Speculation about the myriad of wrongful possibilities leads to prevention planning. 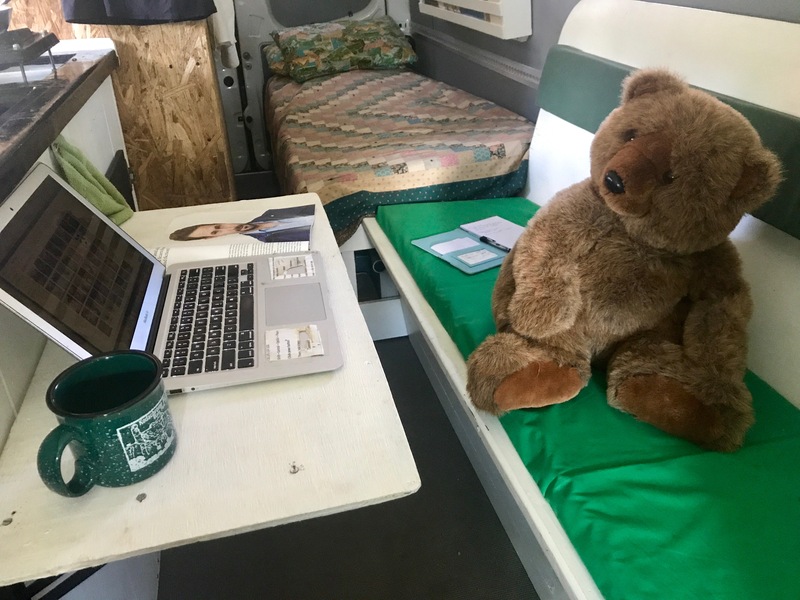 What better place to plan than here inside my 24-foot land yacht, outfitted by my beloved Ronald O, which his family generously left for me. So it is that my indomitable spirit proclaims it is now or never. (PS, that is BEAR in the picture. He is my land yacht companion gifted to me from Colorado friend, Norine. He certainly looks better than a selfie of me at this hour of the morning). About 15 days have passed since I ventured into this journey from my comfy country cabin in southern Colorado to the world’s best humidifier (Florida). Boat shopping and hanging with girlfriends and family has been a whirlwind. Regardless of how my days are being planned the norm is driving a minimum of 100 miles. This journey’s purpose transformed from a vision into reality on September 28. After two days of drive/rest/drive/east in an iterative relaxing rotation, Bear, Teddy and I safely arrived at the Blue Water Bay Marina Complex in Niceville, Florida. Spending the night in their parking lot provided a welcome respite. I have all the essentials in my 24 foot long Mercedes sprinter van. The twelve day preparation period for this journey, as you may have read on my previous blogs, was an emotional nightmare. From the daily trauma of waking up each morning in widowhood to budgeting for a preferred future, to appreciating family and friends, the journey reminds me I am a lucky gal. Those who I believe are my friends, are acting like friends. These woman live intriguing lives. From my sister who has become my best friend, to my sailing/dinner making friends Pat, Linda n Maryanne, to my ladies coffee and wine Wednesday crew, to my teaching colleagues and to my newest, most musically inclined cowgirls n hiking buds, Debbie, C. Phyllis, Marsha, Polly Judy, Mary, and Deb G.,,,,I am blessed. —oh yea and my cousins Ann, Necee and Nori are the best! Just so everyone knows here is the immediate plan. Between dates I am shopping for the next legendary sailing craft and visiting folks not yet on the schedule.